If you like George Benson's playing on the recordings he did with Jack McDuff, then you probably also enjoy Grant Green's work on His Majesty King Funk, which of course means you've got Kenny Burrell's Chitlins Con Carne on one of your playlists along with Wes Montgomery's Bumpin' On Sunset. 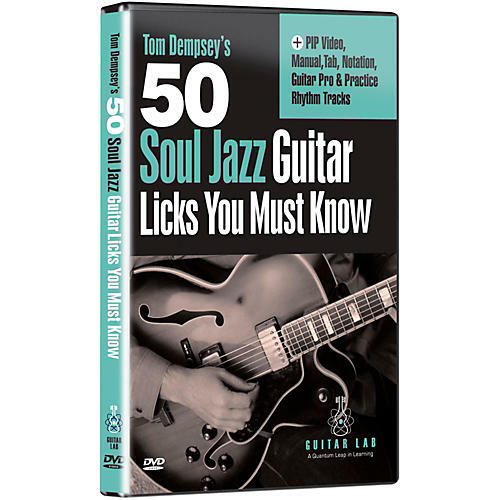 OK, run all that through the filter, take into consideration that you play guitar, and out pops a forgone conclusion -- you will majorly dig this collection of 50 Soul Jazz Licks You MUST Know from Tom Dempsey. Soul Jazz grooves are wide open and great fun to play over because the rhythmic and harmonic framework is relatively simple thereby providing a highly improvisational landscape to work with. However, in the words of Albert Collins, "Simple music is hard to play," and that's why this handpicked collection of licks will serve you very well by stoking your vocabulary with ample ideas, motifs and other tricks of the Soul Jazz trade. Good news! You already have the toolset at your fingertips if you're relatively familiar with double-stops, pentatonic scales, bends, octaves, repetition, the mixolydian mode and chromatics. So, not a lot of new rocket science to digest. It's more about the phrasing, rhythmic feel and improvisational approaches that you'll be focusing on. More good news! Tom dug deep into the Soul Jazz monster guitarist roster for inspiration; Kenny Burrell, Grant Green, Wes Montgomery, George Benson, Pat Martino, Melvin Sparks, John Scofield, Peter Bernstein, Eric Kasnow, Mark Whitfield, and Norman Brown are all paid homage to. All of the licks are first presented over a rhythm track for context , which is then followed by a detailed breakdown of the line along with the techniques being employed to perform it. Everything is tabbed and notated, plus you'll also get all of the rhythm tracks to practice the lines with on your own. Add these 50 Soul Jazz licks to your playlist today!